Qt™ Ceiling-Mounted Speech Privacy Systems are unique in several important dimensions. Qt Systems produce a sound that is so effective in masking speech that the sound produced by these systems is patented. In practice, the sound produced by Qt Systems provides effective masking of speech at much lower sound levels than are required for similar results when using other brand systems. Listen to a clip of the patented Cambridge Masking Sound produced by QT™ Systems. We recommend ceiling mounted QT Systems for open cubicle spaces over 500 square feet in area, and for installations in which treatment of 4 or more offices is desired. Qt Systems are modular and easily expandable to cover from a single office to a million square feet or more of space. Unlike other ceiling or plenum mounted systems, QT Systems are designed for user-level installation, with no special skills or experience required. Building a System is Simple and Easy. Qt Systems require a Qt Control Module (Qt 100, Qt 300, or Qt 600) control module and emitters (special ceiling-mounted speakers) in sufficient numbers to cover the area to be treated. The number of emitters is generally recommended to equal the total area to be treated, divided by the square of the ceiling height. So for example a space with 2,000 square feet total, and a 10 foot high ceiling would need 20 emitters (2000/(10 x 10) = 2000/100 = 20). Both the Qt Control Module and the emitter kits come with all the parts you need to complete your installation. Emitters are adjustable, letting you customize the sound level in each area as needed to achieve your goals of reduced distraction and/or improved speech privacy/confidentiality. 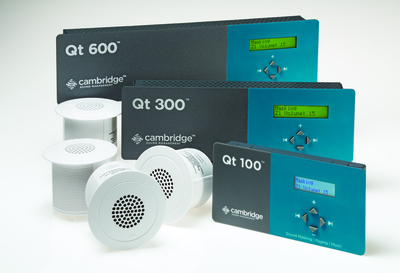 As a direct distributor for Cambridge Sound Management, we carry a full line of equipment and accessories for Qt systems. See the table that follows for details. For pricing, please contact . Qt 100 1 zone control module for up to 120 emitters. Includes one integrated aux audio input. Qt 300 3 zone control module for up to 360 emitters. Includes two integrated aux audio inputs and network control. Qt 600 6 zone control module for up to 720 emitters. Includes two integrated aux audio inputs and network control. Complete System: 1 zone Conference Room Edition System-w/ 8 x 16' cables, 8 emitters, 50' home run cable, and privacy signs. DM Plastic drywall mount, hole saw (HS-DW) purchased separately. CM Conduit mount/back can, hole saw (HS-DW) purchased separately. PBC Plenum back can. This back can meets fire safety and air plenum requirements that are common in Nevada and many Illinois counties. For pricing, please contact . Oasis QT is listed among 2,100 environmentally-preferable products due to its energy conservation, noise control, reduced material use, exceptional durability with low maintenance requirements, and contribution to LEED points. Qt Conference Room Edition is a pre-packaged sound masking system designed to be installed in and around conference or meeting rooms to make sure private conversations taking place inside remain private. If you need to secure conversations occurring in your conference room, this is the perfect solution in a box.